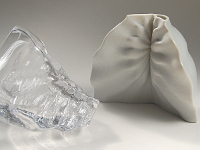 GLASS CLAY - since The Transaction Project, a collaborative project with Charlie Stern and Belgium design studio UNFOLD – see studio journal, I had became interested in what we called the ghost pieces - the pieces where the 3D printed ceramics had broken off leaving just the glass form. While teaching on the ENSA Limoges course at CIAV Meisenthal, a glass studio in North East France I’ve had the chance to revisit this ceramic printed blowing moulds technique. 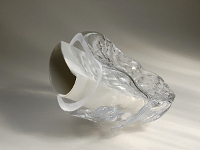 The advantage of working digitally is that I can access forms from different sources, mirrored forms, scaled and edit related information to easier move between working in the two materials and combine glass and clay in one work. The forms were generated by combining historic Meisenthal shapes from the online digital library with my own digital 3D files. So this theme of duality runs through the body of work. 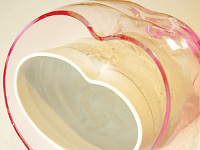 From referencing forms from two sources, to combining two materials, clay and glass to more abstract elements of positive and negative and material and light. 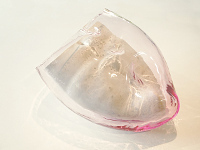 In the Refraction series I am interested in the layers of skin that build to make the object. 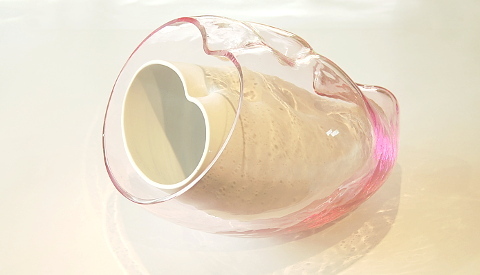 Referencing the tradition of pottery, of a clay body covered in glass I have separated out these two elements so now there is space between the outer glass skin and the inner clay body. This gives space for light falling on the body to become refracted offering a surface decoration that is constantly changing according to the light condition.